LAMJUNG, August 2: A village settlement in upper region of Lamjung district is in high risk of being buried by landslides following the incessant monsoon rains. 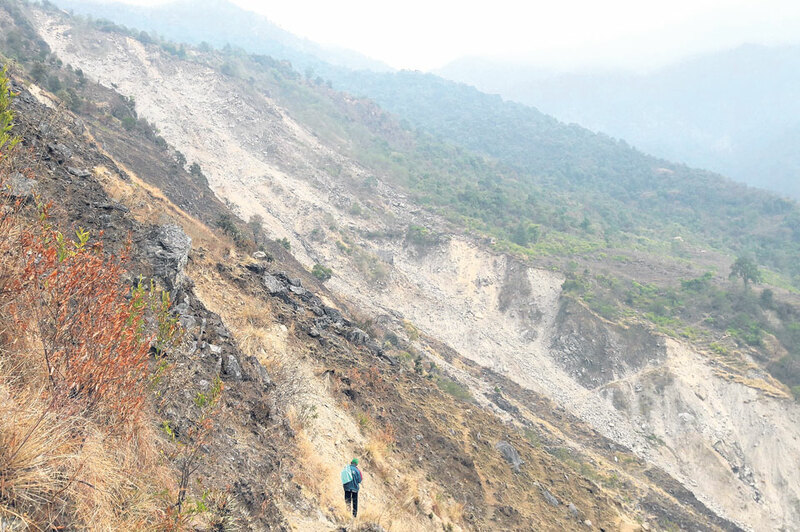 Landslides near Chiplagaun of Marsyangdi Rural Municipality-5, have triggered fears among the local inhabitants that landslides may bury them. According to the locals, the landslides that have been occurring in the nearby areas of the settlements have been closing in. “The risk is very high. It looks like the landslides will wash away even a local school - Ratna Bidya Mandir Primary School - along with lives and properties,” said Lekman Gurung, chairperson of the ward. “Landslides have already washed away most of our farms. Only a small portion of our farm have been spared. I already feel like we are squatters,” said Kamrang Gurung. She expressed her fear that landslides might wash away their houses after the farms. Families of the households who are at high risk have abandoned their houses and camped some distance away from their houses. The District Coordination Committee, District Soil Conservation Office among others have claimed to have worked for landslide prevention. Yet, the locals say they have not felt any noticeable difference. Kemeru Gurung, chairman of Himali Community Forest Consumer Group, said they have visited District Forest Office many times to request them to work for landslide prevention. “However, we have not achieved much,” he said.